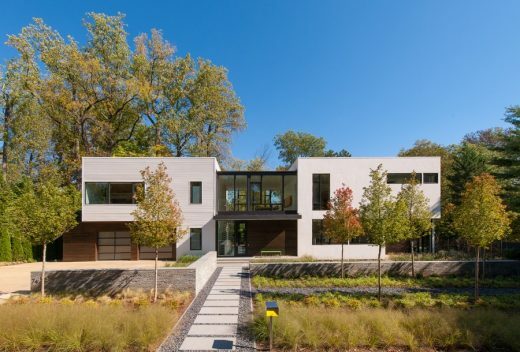 A successful builder / developer with a history of constructing modular houses purchased a lot in a desirable neighborhood near Washington, D.C. with the intention of building a spec house. When a potential buyer expressed interest in the lot, the developer proposed a modular house as a solution to a tight budget and time constraints. However, the craftsman and colonial style modular houses typically built by the developer did not appeal to the potential client, who desired a light-filled, modern house. The bm Modular One House is designed to both fulfill the wishes of the clients and to provide the developer with a “modern house” typology that fills a void on their menu of modular houses. Relative to similarly sized custom houses in the expensive Washington, DC real estate market, this house is designed to be flexible, efficient and affordable. bm Modular One is composed of thirteen modules and was constructed in two weeks in a plant in southern Virginia. It was then shipped to the site on flat-beds and assembled on-site within two days. Energy efficient shells arrived to the site with windows, plumbing, electrical and HVAC ducting in place. The interiors were dry-walled and primed, ready for finishes. The foundation and basement were constructed with polished concrete floors on-site, while the modules were being fabricated off-site. High energy-efficient goals are further enhanced as a result of a geothermal HVAC system, and tight, super-insulated, exterior floor, wall and roof systems. The house employs repeatable parts that can be combined into custom configurations. This is exemplified by the fact that the modules are arranged to meet restrictive zoning requirements on an irregularly shaped lot. The modules are delivered primed, yielding a blank canvas, and allow for the extent and level of finishes to remain flexible. In this case, finishes include maple flooring, walnut millwork, aluminum stairs and other materials specific to this client’s preferences, while large expanses of glass are designed to allow for varying orientations. The house brings together durable corrugated metal siding with stucco and Spanish cedar. The massing provides opportunities to combine several exterior materials so that the house can be adapted for different environments. The first of an undetermined amount of future versions, this house can be modified to meet differing client’s needs and varying sites. Both Modern and filled with light, the house employs all of the intended benefits of modular building without compromising proportion, light, scale and texture.